Leftover tomatoes? Add some veg and make this spiced tomato sauce. This year was a good year for tomatoes. From just 5 plants (of which 3 were planted in hanging baskets, the Tumbling Tom variety) I’ve got so many fruit, that we didn’t have to buy them the whole summer. And I made ketchup, also pickled some green tomatoes…And still had some extra. So I came up with this spiced tomato sauce. Spiced with chili and horseradish and flavoured with herbs such as parsley, celery leaves and lovage. This will keep for quite a long time, in the fridge (to be safe) or in a dark cool place. 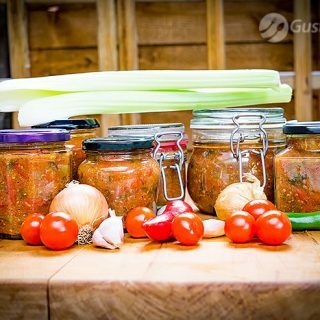 Use it for soups and broths, stews, or even as a spiced dip, some kind of tomato salsa. See the short video below and the description under the clip. I made this as I went along, improvising, adding and tasting all the way. The quantities above will work well. But go ahead and add your own stamp and twist on it. Reduce (or indeed increase) the chilies and horseradish for heat. Add more or less garlic, and the herbs that you like. Do the same with the sugar and salt, just make sure that you taste the sauce and tweak it to your liking. 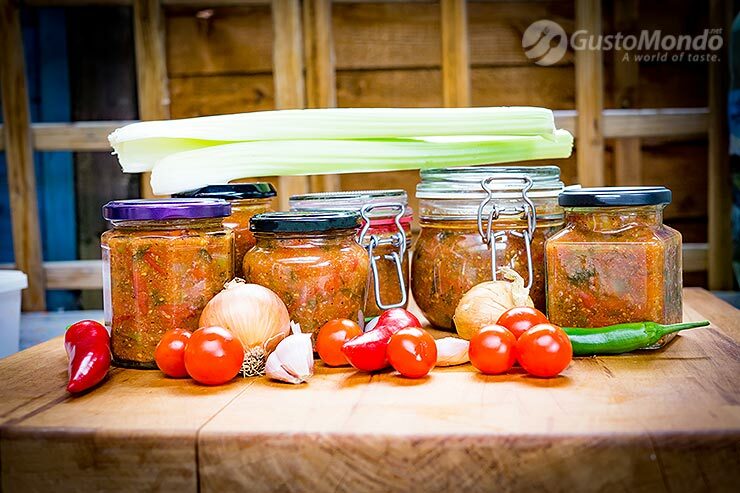 Keep the sauce in clean, sanitised jars or containers. If you want you could pour a thin layer of olive oil on the top of the sauce before closing the jars. Or use some other method of prolonging the shelf live, such as putting the jars in a tray with water and placing them in a hot oven (at about 100C) for one hour then leaving them to cool in the oven before storing. Peaches and lemons hot chili sauce. « Try baking aubergines and pairing them with ras el hanout and feta cheese.